AMARILLO – Spring planting is just around the corner, so for producers with irrigation systems, now is a good time to do some safety maintenance on their pivot systems, according to a Texas A&M AgriLife Extension Service specialist. In the spring, producers are busy making seed selections and prepping fields, but they also need to remember how important it is to maintain center pivots, said Dr. Kevin Heflin, AgriLife Extension agronomy program specialist, Amarillo. Annual center pivot maintenance can enhance the efficiency of the irrigation applications as well as the safety of the system, Heflin said. While modern center pivots are safe and essential tools for agriculture production, every year there are accidents and tragedies surrounding these irrigation systems, primarily on the electrical side. Estimates are there are more than 7,500 center pivot irrigation systems in the Texas High Plains alone, Heflin said. After working with and monitoring many systems over the years, he wants people to know there are some simple things to look for in a safety and maintenance check that can save lives and time once the irrigation season gets underway. “Some of these systems are older, so it is important to make sure to maintain them and look for potential problem areas,” he said. – General maintenance issues. Tires, lug nuts, truss rods and brackets, and gear motors are all things that need visual inspections. – Storm damage from wind and lightning. – Rodent damage in and around electrical boxes. – Vandalism, such as the stripping of copper wire from these systems. Heflin said producers should also ensure electrical boxes are relatively clean and fuses/breakers are properly sized for the voltage and amps being used. He also said it might be good to have a certified electrician inspect the terminal lugs in the electrical boxes to ensure they are tight and making good contact with the wires. These routine maintenance and safety inspections do not have to be overly burdensome, he said, and they are worth the time and effort now to prevent breakdowns and tragedies down the road. Persons traveling through the busy intersection of Southwest 45th Avenue and Teckla Boulevard in Amarillo may take a moment to notice the banking center built there about seven years ago. However, few realize that it is home to one of the city’s larger commercial rainwater harvesting installations. Construction of the FirstBank Southwest (FBSW) Western Banking Center begin in 2012. Bank officials and Landscape Architects agreed that they could do more to conserve water — even though xeric landscaping was a major component in the original landscape plan. Before construction, the 36,252 square foot site allowed 100 percent of rainwater runoff to enter the City of Amarillo’s storm water system. Addition of an on-site rainwater harvesting system helps reduce the amount of water used for landscape purposes and lessens storm water runoff in this flood-prone area. “Residents of our area are Texas tough and Panhandle proud. When you think about it, we are doing the same thing that our early predecessors did. They had to capture water (in cisterns) in order to maintain a viable lifestyle,” said Smith Ellis, Chairman of the Board, Chief Executive Officer, and President of FBSW. It was hot and dry when I visited the bank in late August. David Pace stood in a doorway and pointed toward the tan-colored pavers around the building. He has served as FBSW properties manager since 2009. “Every so often, people will ask to see the system during a rainfall event. I like to watch the expression on their faces as rain flows across the parking area and eventually disappears into the permeable paving system,” he said. Rain falls upon the parking lot and the building’s metal roof. Downspouts channel water from the roof to the pavers. Once below the pavers, it flows through gravel backfill into 530 linear feet of perforated pipe. The pipe conveys water into an underground tank. “The tank is basically a rigid ‘milk crate’ with a non-permeable envelope around it,” says Jason Habeger with Turner LandArchitecture in Amarillo. The company designed the rainwater harvesting system. The paver system base can hold up to 12,000 gallons of harvested rainwater. An additional 14,600 gallons of rainwater can be stored in the underground tank. This gives a potential storage capacity of 26,600 gallons. That is the equivalent of 99.6 percent of the rainfall collected from a two-year storm event. “This is not a self-sustaining system — even though we have the potential to collect a large amount of water. For example, our last major rainfall was in September and we were out of water by February. There are backup connections to use city water for the landscape, if needed. This still saves water because of the xeric landscape. We are equipped to handle the ebbs and flows of rainfall events,” said Pace. The banking center contains 7,720 square feet of designed landscape area. The perimeter includes a rain garden/swale with boulders from Marble Falls, decomposed granite mulch, and river cobble. This allows rainwater to percolate into the soil. Planting the area in tall fescue would require an application of approximately 171,661 gallons of water with an automatic landscape sprinkler system during the growing season. Designers incorporated a point source drip irrigation system for efficiency and flexibility. Each bedded plant receives about one gallon of water per hour through one to five strategically placed emitters. Trees receive one gallon of water per hour through two bubblers. The xeric landscape, combined with the drip irrigation system, will reduce landscape water use by 60 percent as compared to a traditional tall fescue lawn. Both Habeger and Pace agree that this project has increased awareness of the use of xeric landscaping. It also prompted a change in the City of Amarillo’s landscape ordinance with the addition of a recommended plant list. “People in Amarillo are starting to understand that they can have an attractive landscape with native drought-tolerant plants, rather than relying on traditional turf and trees. This project has inspired them to ask how they can accomplish similar results and be a good steward of our natural resources,” said Habeger. Ellis agrees that it is important to lead by example. “This rainwater harvesting project has exceeded our expectations. It was a costly project – but it is worth it for several reasons. It enhances the community in which we are a corporate partner. Even more importantly, it highlights some of our water issues and provides a way to combat those problems. It is the right thing to do – even though it is the pinnacle of a small effort toward water conservation. Believe me, this isn’t the last drought that we will ever experience,” he said. BUSHLAND – New center pivot irrigation technologies are only beneficial if they are being used, according to a Texas A&M AgriLife Research engineer in Amarillo. Thomas Marek is leading a team from Texas A&M AgriLife and Texas A&M University to ensure the latest advancements in agricultural irrigation management can be readily integrated for applications in the field. The team is working to design a system utilizing off-the-shelf sensors and components to create a cost-effective and independent platform that will allow producers to realize benefits of irrigation technologies by integrating and automating information and decision support tools. * A wireless sensor network with anomaly detection. * An irrigation system controller using real-time and forecast data, integration of data from multiple sensor inputs and unmanned aerial systems, models and safety. The multifaceted project integrates in-field data from multiple sensors and uses machine learning techniques plus crop models to automate irrigation scheduling decisions, Marek said. Additional faculty members on the project include Dr. Dana Porter, AgriLife Extension engineer, Lubbock; and Dr. Jiang Hu, Texas A&M professor of electrical and computer engineering, College Station, along with three team members in his department, Dr. Justin Sun, Yanxiang Yang and Hongxin Kong. An accompanying soil water sensor installation and placement study with the project involves Dr. Kevin Heflin, AgriLife Extension program specialist, Amarillo; and Dr. Gary Marek, U.S. Department of Agriculture-Agricultural Research Service research agricultural engineer, Bushland. “There are some great advanced irrigation technologies available, but they are complex, underutilized, difficult to use and not well integrated in existing control systems, therefore their benefits are not being fully realized,” Porter said. She said the cooperative and complementary efforts in several research studies at the Bushland research facilities shared by AgriLife Research and USDA-ARS should help change that. – Improved center pivot irrigation positioning and speed control. – Improved variable rate irrigation control with real-time updates using in-field near-real-time data plus predictive crop water-use capabilities. – A soil-moisture in-field sensor placement method to optimize wireless sensor nodes to balance cost with necessary data reliability. “In our case, advanced automation includes automated communication of data from soil water sensors to the pivot controller,” Marek said. Utilizing tools such as real-time soil moisture monitoring, near-real-time and short-term predictive crop evapotranspiration or crop water use, quantitative precipitation forecasting and an artificial intelligence algorithm, he said they are able to automate the “when, where and how much” decisions of crop irrigation. Development was conducted whereby the platform-independent control system could be retrofitted into existing center pivot irrigation systems. The project team has several patents pending as a result of the work, Marek said, adding this is one of the best research teams he’s worked with in his irrigation career. Funding and in-kind support for the project was provided by a Texas A&M University System Water Seed Grant, AgriLife Research, AgriLife Extension, Texas A&M Engineering Experiment Station, High Plains Underground Water Conservation District, and the USDA-ARS Ogallala Aquifer Program. 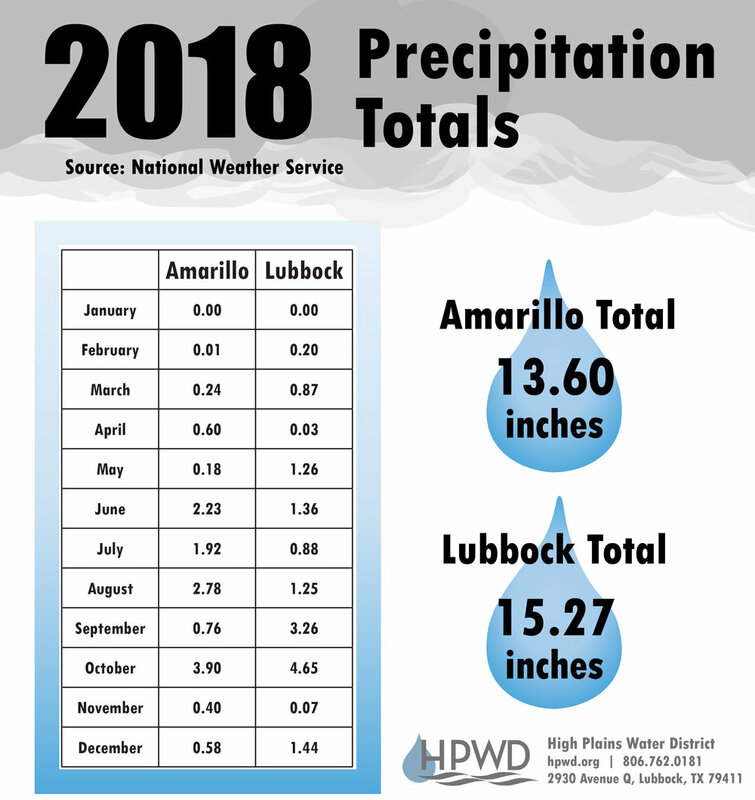 Here are the unofficial 2018 precipitation totals by month as recorded by the National Weather Service forecast offices in Amarillo and Lubbock. Dr. John Nielsen-Gammon reported statewide temperatures from May through August were tied for the second hottest on record, and summer 2018 was also drier, with statewide precipitation levels through August running 3 inches below average, ranking the year to date as the 27th driest on record. But conditions changed drastically beginning in September, which he said was the fourth wettest month statewide on record with 6.77 inches of rainfall on average. October was even wetter with over 7 inches of rain on average, which made it the second wettest month on record. “Already at the end of October Texas has received more rainfall than it receives on average in an entire year,” Nielsen-Gammon said. The high rainfall amounts in September and October made it easily the wettest two-month period on record, he said. Of the 10 climatic regions around the state, Nielsen-Gammon said four had stations that recorded more than 30 inches of rain over the past 60 days. Some notable observations include, 45.03 inches near Galveston – the highest reported total; 32.65 inches in Madisonville; 33.65 in Bonham; 31.65 inches near Rock Springs; 24.24 in Haskell; 22.38 in San Antonio; 18.27 in Harlingen; and 15.3 inches in Tahoka. One important exception was Amarillo, which received 4.64 inches and remained one of the drought areas in the state along with parts of the Trans Pecos region, Nielsen-Gammon said. “The last 60 days has pretty much wiped out all of the color from the drought monitor map for most of the state,” he said. Nielsen-Gammon said the state didn’t catch any rain from Atlantic tropical storms but caught significant rains from Pacific tropical storms that made their way through Mexico and into Texas. This year was the most active East Pacific hurricane season ever, which typically allows for significant rainfall from thunderstorms in Texas. Texas also experienced a few cold fronts that stalled out across the state bringing repeated rain activity day after day, he said.